Made from just one skein of lovely Malabrigo Worsted Merino, this romantic and starry cowl is a quick and easy project with motifs that are joined together as you go. A warm and luxurious gift for yourself, or a loved one! 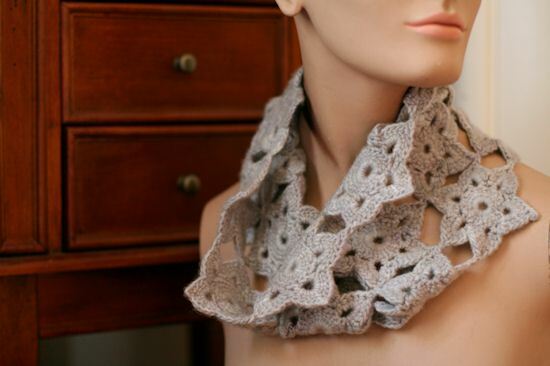 This cowl is created from 21 star motifs (3 rows of 7; see assembly diagram) joined together as you go. Once all motifs are created, block the piece flat and join end motifs together to create the cowl. Note: When joining motifs, back sides of motifs should be facing each other. Base Chain Ch 6 join with sl st in beg ch to form a ring. (Do not use magic ring for this project). Rounds 1-2 Work same as for Motif 1. Round 3 Ch 3 (counts as dc), 3 dc into ch-5 sp, picot, 4 dc into same ch-5 sp, sc into ch-3 sp, 4 dc into ch-5 sp, with backs of both motifs facing, jp through any picot of first motif, 4 dc into same ch-5 sp, sc into ch-3 sp, 4 dc into ch-5 sp, jp to the next adjacent picot of first motif, 4 dc into same ch-5 sp, sc into ch-3 sp, *4 dc into ch-5 sp, picot, 4 dc into same ch-5 sp, sc into ch-3 sp,* repeat from * to * 2 times, sl st to top of ch 3. Fasten off. Round 3 Work as f0r Motif 2 using assembly diagram to determine where to place picots and joining picots. Weave in ends. Wash and block piece flat. After blocking, use yarn needle and yarn to join end motifs together at appropriate picots. Weave in ends.